Blair Albom's practice focuses on complex commercial litigation. She represents banks, major public and private companies, and individuals in connection with contract, creditor, insurance, and other disputes. 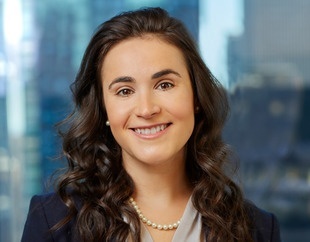 Ms. Albom also represents clients in connection with white collar matters involving the SEC and other enforcement agencies. Representation of BioReference Laboratories in connection with contract litigation against Diaceutics, Inc. Representation of U.S. Bank National Association in its capacity as indenture trustee of certain notes issued by Windstream Services, LLC in connection with litigation concerning an alleged default under the indenture. Ms. Albom and the firm litigated the matter through trial, with the court ultimately ruling in favor of U.S. Bank on all points, and finding that Windstream had in fact breached the indenture. Representation of a major bank and brokerage firm in a dispute over purported termination of a distribution agreement by Goldman Sachs. Representation of a blood testing laboratory in defense of litigation brought by Horizon Blue Cross Blue Shield of New Jersey alleging improper billing for testing services. The matter includes a claim alleging violation of New Jersey's insurance fraud statute. Representation of a pro bono client who had been barred from seeing his infant son. The Southern District of New York granted summary judgment in favor of Ms. Albom's client, and the matter is currently on appeal before the Second Circuit. Representation of a private equity fund in connection with an SEC examination. Prior to joining Friedman Kaplan, Ms. Albom was an associate at Debevoise & Plimpton LLP. Ms. Albom is a member of the Criminal Law Committee and the Mass Incarceration Task Force of the New York City Bar Association. She is also a member of the American Bar Association and the Federal Bar Council.